Want to learn the fine art of Henna design? Have a passion for art and want a canvas as unique as the body? Looking to start a career as a henna artist? We are here for you! Enroll in our henna class. Read below for what is covered in this comprehensive variety of henna classes. For the Career Henna Class, we suggest 3 class sessions of 2 hours each. $250 for the first session. $150 each session following. For the Hobbyist Henna Class (ages 15+) we suggest 1 class session for 2 hours. $150 each session & includes henna to take home. For the Henna Fun Class (all ages) we can teach up to 5 students for 1.5 hours. $80 each student & includes henna to take home. When are the Henna Classes? Each class is designed for solo, one-on-one instruction. Each class is based around your schedule. For each type of class, you will learn with hands on, one-on-one instruction from henna artist Kelly Caroline – a henna professional specializing in the art of henna for over ten years. The History of Henna – Where it originated? How it was discovered and how ancient civilizations first used the plant? What traditions and ceremonies centered around henna application? How Henna is Used Today – What place henna has in today’s society and cultures around the world? How it is used in America? How to Make Henna Paste – Using Kelly Caroline’s personal recipe the student will learn the artisanal process that takes time to master. Learning the proper ingredients to use as well as the improper ingredients that are to be avoided. How to Cut and Form Henna Cones – What materials to use for henna cone formation and how to properly create them to avoid problems? Troubleshooting and practice for making ideal henna cones. Henna Application Basics – Proper holding of henna cones and application of henna to the body. Basic designs and where they are to be applied to the body. How to look at a photo and where to start and how to create the look. How to Work with Clients – How to help the client identify what design they will like and what is the best area of the body to apply each design. Professional Courtesies – The “do & do not’s” of being a hired henna artist for events. Advanced Henna Application Techniques – Building on the student’s progress after home practice. How to work “on the fly” creating your own designs instead of following a photo. Social Media Tips and Tricks – How to build a portfolio and share it. Each student is given many supplies to continue their learning including pre-made henna cones and raw henna supplies to use in the future. The student also has access to the instructor via email for further questions. 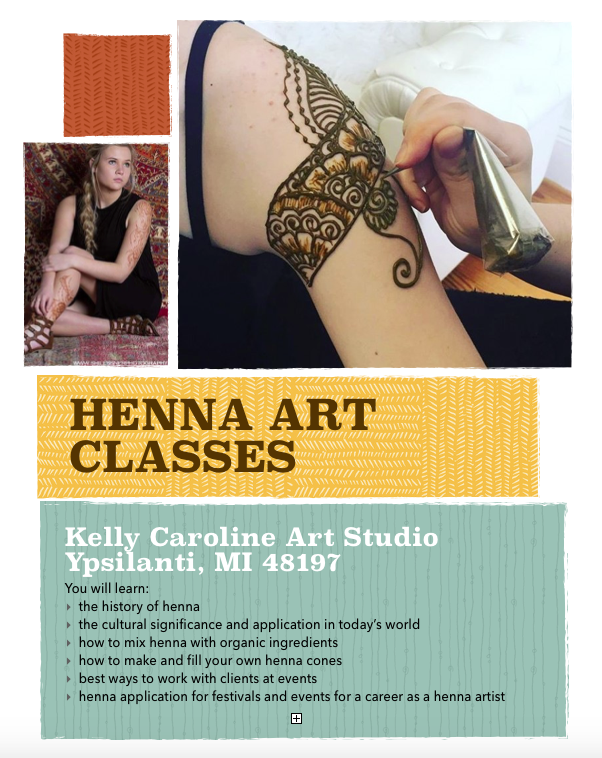 The intention of this class is to provide more than just basic henna skills and knowledge. Our hopes is to instill inspiration to the student and leave them with a wealth of resources and a guide of how to move forward in a career in henna art.